When youâ€™ve got meat and cheese, who needs carbs? The carnivorous lifestyle is hot topic in the low carb world. This meat eating diet consists of animal foods alone. You donâ€™t have to follow any rules as far as food timing, macronutrient breakdowns, or portions.Simply eat when youâ€™re hungry and until youâ€™re full. Although itâ€™s hard to reconcile the assumption that a carnivore diet is not only safe but helps to improve your health, I have decided to compile this work for you. And, since meat is one of my favorite foods, who else better to do that for you? 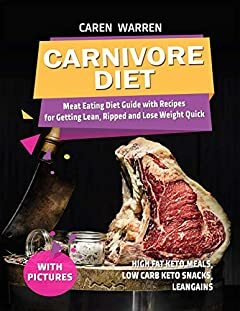 â€œCarnivore Diet: Meat Eating Diet Guide with Recipes for Getting Lean, Ripped and Lose Fat Quick (high fat keto meals, low carb keto snacks, leangains)â€ by Caren Warren is pure goodness in the palm of your hand!